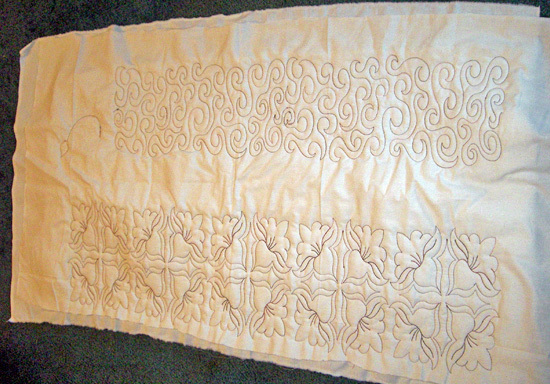 I've been practicing on my prostitcher and recently worked on repeating a pattern. I loved how it turned out and didn't want to discard it. So, I figured I would re-purpose it into a table runner. I spent Friday adding the binding around the edges while I was having a front door installed. Whala, instant table runner for my long library table. Also, here's a photo of my new front door. As soon as it was installed, I added gallery glass to the door to give it some "color". I love the look from the inside. It gives us more privacy but you really can't see it from the outside unless we have the foyer light on. 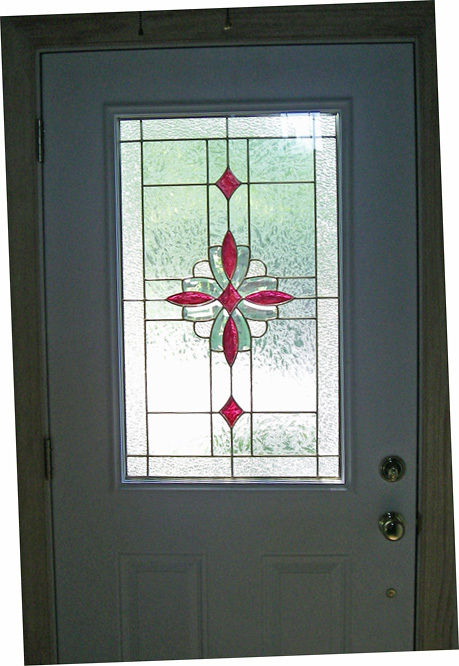 I love the look of the colored stain glass without the price and without the permanency! Happy Memorial Day and thank you all those in the military for your service!! love the recycle element here, very "green" of you. I agree, it was too wonderful not to use. Good job! That's a good idea! I always hesitate to quilt on an actual quilt, I don't know why it didn't occur to me to make practice quilts and turn them into table runners or placemats. Thank you for your comments. The door was easy, I used this stuff called Gallery Glass that I picked up at Michaels Craft place. Here’s a link to the manufacturer http://www.plaidonline.com/apGG.asp with info about it. It’s like a paint that dries rubbery. Once it dries, it can peel off the glass when I don’t want to see it anymore. If you try it, one hint… place a light coat on first and it will dry pretty fast, then come back and do a second coat for the darker color. I'm Back - Santorini Lap Quilt and Celebrations! !